After seeing how far LED lights came, I knew I would be building one. Special thanks for everyone who donated their time and information for this project. Countless hours researching and messaging people about their setups. I made this DIY to help some of you that are interested in LED lights and/or looking for information about assembling your own. Replacing an old 250w HPS for a 4.5 Sq Ft Tent 1.5ft x 3ft (46cm x 91cm). This hands down this is arguably the best diode out there right now at an affordable price. It has a range of options that can be used build your own custom light spectrum. 3500K and 4000K offers the best of both worlds for vegetative and flowering growth. The possibilities are endless. I was drawn to the Quantum 288 board, SolStrip, and H-Series Gen3 LT-H562D. All these board are in the same class because they all have the LM561c diode and only vary with the amount of diodes on board. But after talking with Mr. @Baudelaire on the customizability, versatility, coverage, and affordability of the SolStrip. I was sold! 3x SolStrip boards will do the trick for a 150 watt system that can output up to a 400w HPS equivalent. The LED system will operate at a 1/3rd of the cost than a standard HPS. 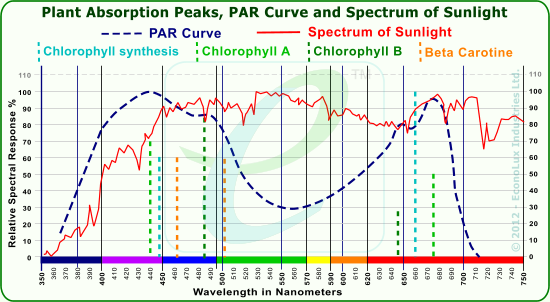 The HPS is struggling to provide within plant absorption peaks for photosynthesis (PAR). Most of the HPS spectrum is in the plants low PAR range. 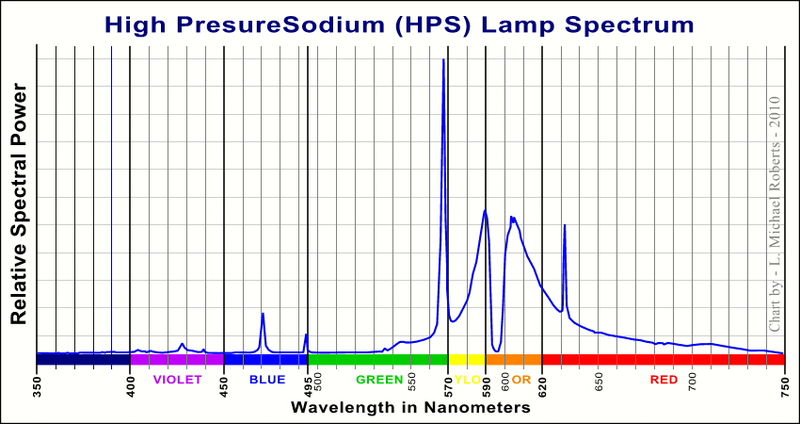 However, a deHPS is 10-15% increase in spectrum than a standard HPS system and produces slightly more towards the reds, but the majority of all HPS are green/yellow spectrum light. 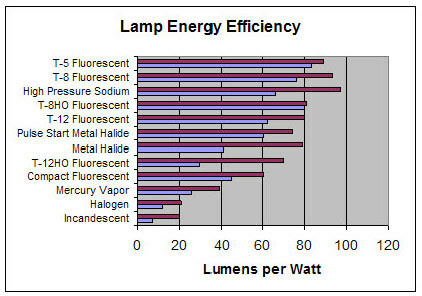 The plant can use any spectrum light however at different efficiencies. The red light is easier to photosynthesize. I chose to utilize 2x 3500K CRI 80 and 1x 4000K CRI 90 for my build. I also made two graphs to represent the spectrum covered between the 2 boards. You can see the overall spectrum produced is following the plant absorption chart above. Ultimately providing a huge boost in spectrum efficiency. I believe this combination will offer the fullest spectrum closest to sunlight. Notice how the 4000K board has a CRI of 90. 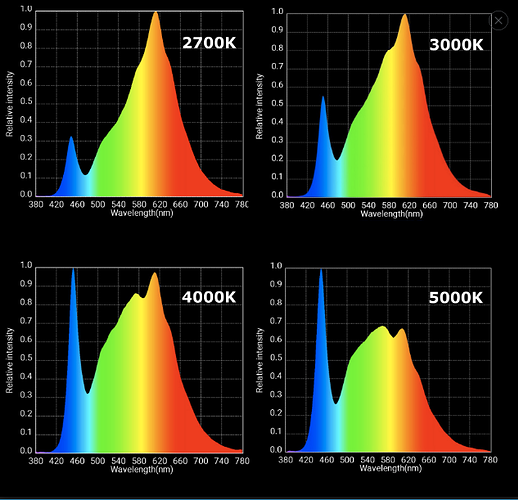 This makes the spectrum have minor differences compared to a 4000K board with a CRI of 80. 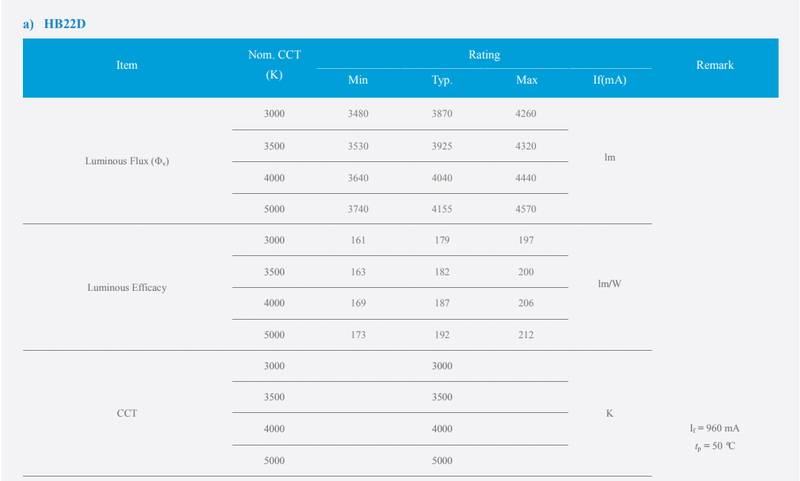 The specifications tells us all the information we need to select a driver with the highest efficiency. I’ve chosen a remote ballast to keep heat down and to offer access to the ballast without entering tent. I wanted dimming capabilities since this light will be for vegetative growth of seeds, clones, and mothers. For my needs, I decided to use Mean Well HGL-150H-24A LED driver as all of their drivers are documented technically and offer the features I wanted. It meets all requirements for 3 SolStrips. So we are going to play a matching game between the specs of the LEDs and Driver. Total watts of 151.2w for all 3 boards matches the drivers’ rated power of 151.2w (yellow). Now we will calculate the minimum diming capabilities and where the efficiency range is for this setup. 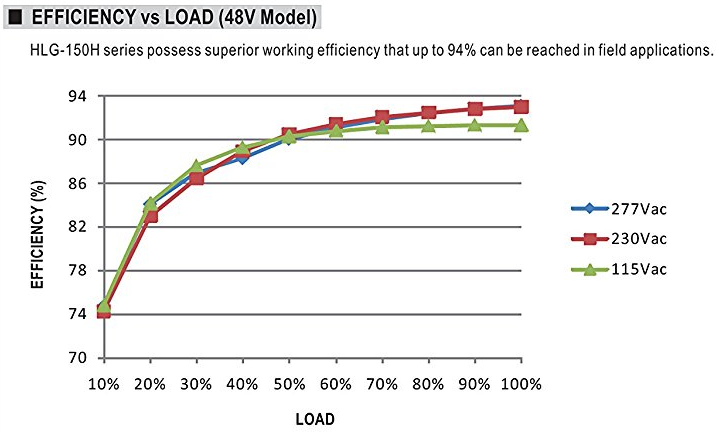 We will make our range by taking the lowest voltage on the driver range and highest voltage on the LED circuit. 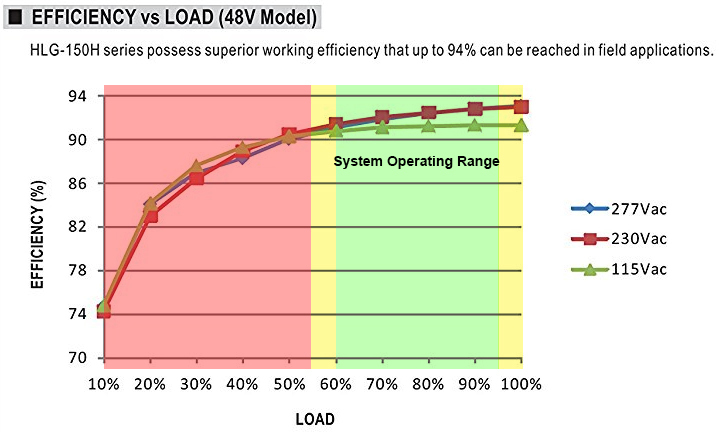 Then we do the same for the Current (Amps) to give our actual systems’ operation range. So now we see that we will be staying at the 90 to 91% efficiency on 115Vac (taking into the 1% loss noted above) The minimum dimmer settings on this unit for this system keeps it from going too low. 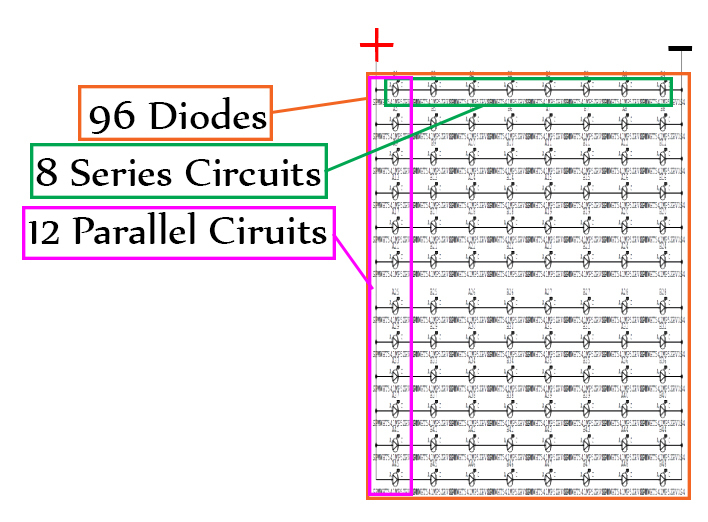 Looking at the diagram above, we can calculate how much current and volts this board will be running at for max power. But how do we actually know the Luminous Efficacy? 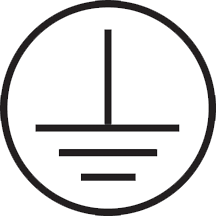 The LM561c diode with a CCT of 3500 @ CRI 80 has an average luminous flux of 36Φv. As you can see our luminous flux increases based on a percentage when our forward current increases. 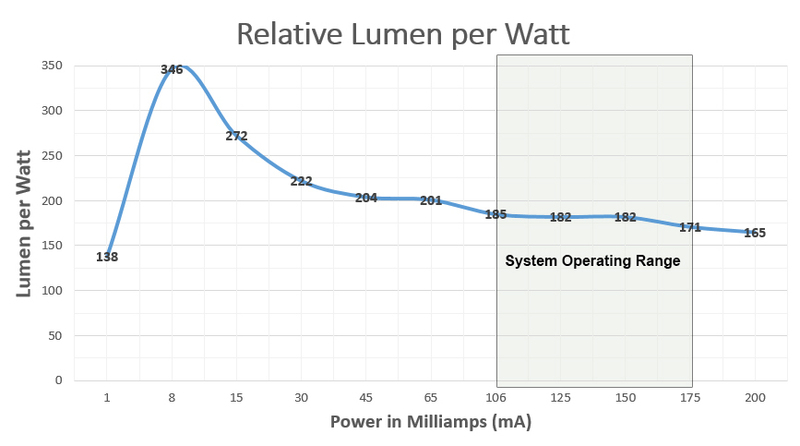 This means if each diode is getting 106mA of power, the luminous flux range increases to 54Φv, however if each diode is getting 175mA of power the luminous flux range increases to 90Φv by using the graph above we can calculating lumen per watt for this systems operation ranges. Lets check the systems load on the houses’ circuits, and verify that our AC power source is suitable. It does state 4 units (drivers) maximum on one circuit. This is to prevent any over loads that may occur when other electrical devices are using the same circuit. Let us start at the wiring for AC plug for the system and work our way to the SolStrip boards. Our whole goal is to make sure everything is properly rated for our system and is built to last. Please do not take short cuts in wiring, it will lead to an electrical fire. I used a 9 ft power cord. 18 AWG should be good for this driver and power load, but I decided to use 16 AWG and this is also UL rated for 300 volts. I want to point out the drivers wires are at 18 AWG, because of that we base our system off of the smaller wire in the circuit. Take apart the plug and string the power cord through the housing of the plug. Slide it down a bit so it is not in the way when we are striping the wires. Strip the power cord about 1 ½ inches, remove the insulation, and then strip the 3 wire about ½ inch. Slightly bend the wire and put it in the wire vice and screw tight. Make sure you are clamping on the bare wire and not the plastic insulation. Do this with all 3 wires. Next slide the housing for the plug and screw together, then screw the clamp on the plug so the cord is secure. We have one end done! I don't solder to often but I do have some experience. I gathered up some supplies for this build, not everything I used shown in the picture but you get the gist of it. So looking at the AC side (input) of the driver, the wires are labeled by color according to ground / live / neural ( , ACL ACN) These wire ends come pre-tinned (wicked with solder) from the driver, so I cut them off and re-striped them so I could inter mesh them with the corresponding wire. As you can see I don't have the nicest solder work, but the solder is completely wicked through and has a very strong connection. Now just match function of each wire from the power cord to the driver. Next I extended the DC side (output) wire. I used a 4 foot power cord with 2 conductor wires. I matched the driver red + (positive) wire to the white wire and the black - (negative) wire to the black wire. I shrink wrap my wire connection to give a nice tight seal. I also put dielectric grease in the tube before shrinking it to protect it from moisture. Its certainly not necessary but it provide extra protection plus it looks very neat. To finish off the driver side of the light I will be wiring in a waterproof quick connect. This will be convenient with the installation within the tent. Same as before wires are soldered together then shrink wrapped. I decide that the frame would be constructed out of aluminum for the add benefits of; low profile, higher heat conductivity, and it just looks cool . I'm not a fabricator, however I was able to build a frame for these LED strips by using some tools I had on hand (Sawsall, Hand Drill, Orbital Sander) Not the best tools but just enough to get the job done. I picked up some aluminum at my local hardware store to make a frame. Cutting and drilling aluminum is very doable with some metal bits and blades. I also sanded all the aluminum to make it smooth once again after drilling and cutting it. Then I used M3 x 8 screws to secure everything together. I picked up some washers at the hardware store for each screw. Everything came together square and the frame is very rigid. I used 18 AWG red and black wires. Since I want to wire these board in parallel I made my own parallel wires for the system. I soldered each junction and shrink wrapped them. I also tinned the tips of the wires so when they slide in and out of the SolStrip they will not fray. I generously apply lots of super lube (silicon heat compound) between the heat sink and the SolStrip then tighten into place with some M3 screws. Then slide in the wires into the boards. This was at the lowest setting, it was the only way I could see the frame in the picture. Any higher the frame was blacked out. Plus the SolStrip is a cheaper solution for the same product, just a different board layout. 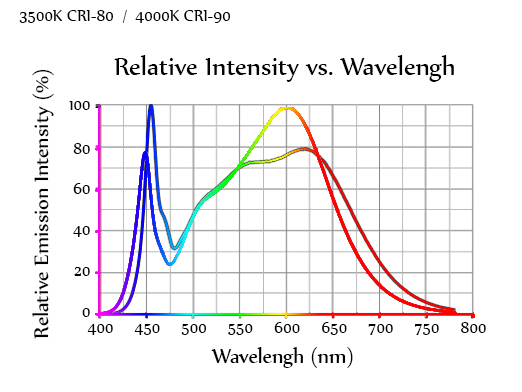 Also the CRI 90 (S3) chip diodes offer superb color rendering properties. Unbelievable possibilities with a compact board, powerful output, custom spectrum capabilities. Great thread. This will be an awesome place to start for small closet/tent growers and new growers into having very decent gear they can build themselves and see how easy it can be. Get a couple red/blue mix strips to blend with the SOLstripes. I've got a very limited number of SolStrips in a red/blue format that are compatible with SolStrip systems (24v, 1400mA operating current). 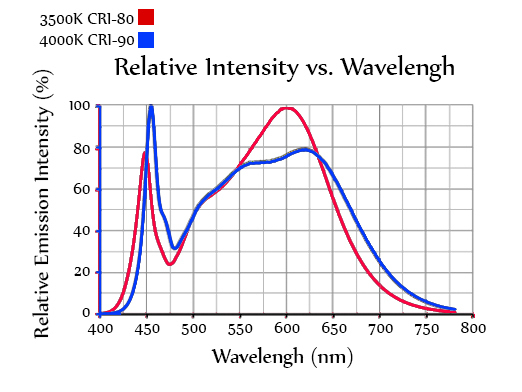 All top-bin Cree XPE diodes, 40 665nm red and 4 450nm royal blue chips, rendering a roughly 7:1 red/blue ratio due to the royal blues 50% higher output (3w vs. 2w). Haven't got them on the website yet due to their limited quantity, but if anyone is interested ping me. Looking forward to Roux's project, he's definitely done his homework. That's awesome. I'm going to order some strips and heatsinks from you to build a 240w for my growlab80. I was gonna run 5@2A but now I think I'm gonna get two red/blue strips and run them all at 1400. You made a great decision, you will be happy with the performance, price, and customer service from @Baudelaire. I want folks to be able to supplement their white SolStrips with additional red/blue spectrum with a mono diode strip that can be easily mixed into SolStrip arrays. are you working on anything with white red and blue on one strip? There's several things in the works but the idea behind SolStrips is not to create one strip that tries to do everything for everyone, but rather to create building blocks for growers to create their own custom spectrums. I call it "Legos for lights". That's why all SolStrip X1 strips are interchangeable and compatible with each other. 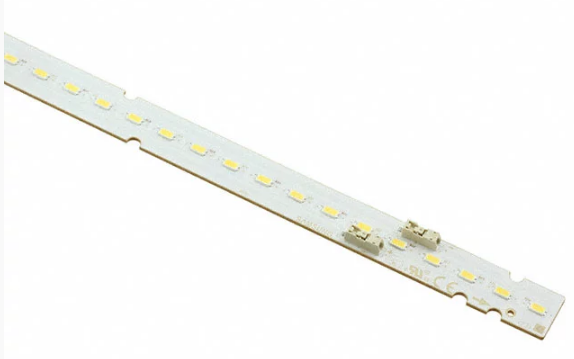 But its important to remember that, other than the Cree strip, all SolStrips are broadband strips that emit a wide range of spectrum, not just a narrow band as with mono diodes. The basic 3500K SolStrip delivers a rich spectrum of blue, amber, red and deep red wavelengths that is completely sufficient to grow outstanding cannabis. The Cree strips are up at Solstrip.com, but two are already gone, just five left til mid- to late January. So are most the strips you make full spectrum? Just got everything completed. I'm excite to put this into practice and start testing. These look so much easier than cobs to setup and comes out looking heaps neater/cleaner too. I don't really like the term "full spectrum", it seems imprecise as it is generally used to refer to COB-style "blurple" emitters which purport to mimic the McCree curve's wavelength intensities. @Roux nice looking wire job, I liked it so much I tried to copy it on mine. Mine is not quite as neat, I’ll try to post a pic later.